These should really be called Banana Coffee Chocolate Chip Moist Crack I Can't Believe They're Not Dairy Little Bites of Pure Happiness. Because that's what they are. But even if we take out that notorious M word, the title was a bit longer than the recommended max. 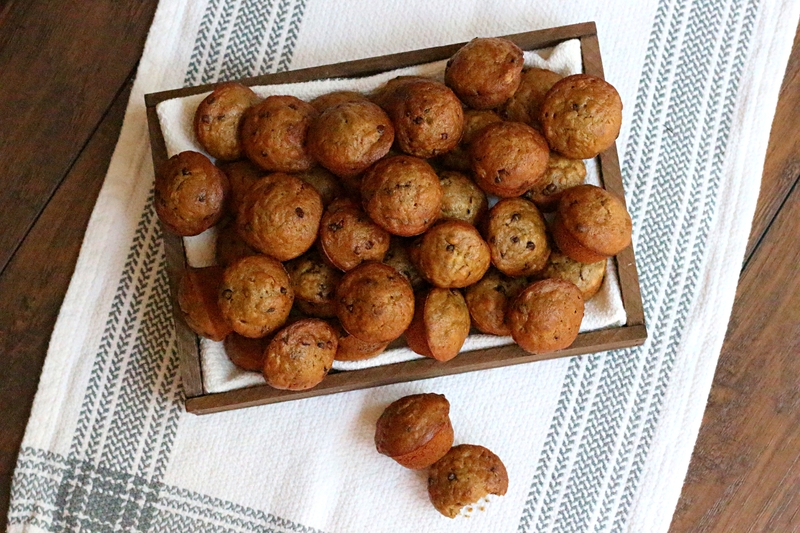 So we'll just call them Banana Mocha Muffins and you'll have to just trust me on all those other adjectives. Would I ever lie to you? Don't answer that. The inspiration for these babies came from the Baked Cookbook. (Available on Amazon here: big fat affiliate link .) I was able to tweak and cut some of the sugar and all dairy (and caffeine) without compromising flavor or texture so we could enjoy them any time without the guilt. If there are mountains of sugar in a muffin recipe, they're not healthy. I don't care how many fruits and veggies you cram in there. Don't kid yourself. And I bake them up in a mini muffin pan because A. They're adorable and B. It's more fun to eat three mini muffins than one full-sized. (And C. You can pop the whole thing in your mouth after you've told the kids to wait until after dinner and no one can tell.) I've personally done extensive research on this topic so you don't have to. Minis win by a landslide. Now, all you banana haters who think these are your average banana muffins and have nothing to do with you. Think again. The coffee (decaf is fine) does something magical to the banana flavor (and my soul) and has won over the heart of the most stubborn banana refuser. My 9 year old. Who also hates coffee flavored anything now that I think about it (*gasp*). The moral of the story is you don't have to like bananas or even coffee (*gasp*). You just have to like muffins. Oh, and I didn't forget about you coconut haters. 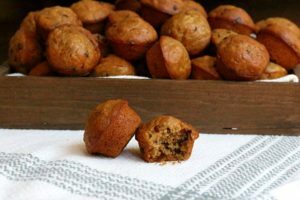 The recipe calls for canned coconut milk but carries none of the coconut flavor over to the muffins. I found it to be the best dairy replacement in this recipe but, by all means, use whatever dairy alternative to milk you prefer. However, almond milk or soy milk will result in a drier muffin. And there's muffin worse than a dry muffin. Preheat your oven to 350°F. Spray a mini muffin pan with nonstick baking spray. In a bowl, mix together bananas, sugars, oil, coconut milk and egg. In a separate bowl, stir together the dry ingredients and incorporate into the banana mixture in 3 additions. Mix until just combined. Fill each well three-quarters full. For full sized muffins, bake 20-25 minutes. This post contains an affiliate link. Purchases made though this link help support this blog. Hi any suggestions other than canned coconut milk. Preparing for a hurricane here in florida and want to make these but all i have is almond milk and want them parve and can't handle using non dairy creamer since its full of chemicals and the stores are all out of coconut milk!!! Any suggestions appreciated.